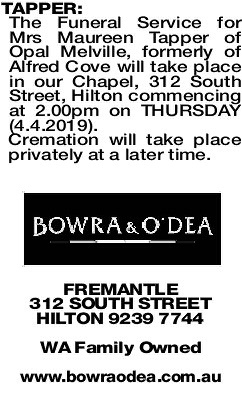 The Funeral Service for Mrs Maureen Tapper of Opal Melville, formerly of Alfred Cove will take place in our Chapel, 312 South Street, Hilton commencing at 2.00pm on THURSDAY (4.4.2019). TAPPER MAUREEN Respected in sports and dedicated to Dad and his career. 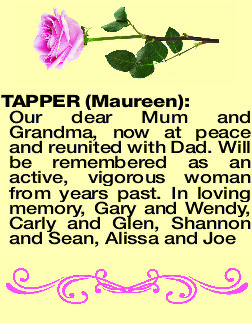 Thanks for passing on your competitive spirit. At last reunited with Dad. Jeff and Moh. Daniel, Julia, Jaxon and Amelia. 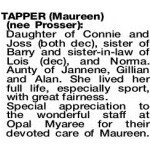 Daughter of Connie and Joss (both dec), sister of Barry and sister-in-law of Lois (dec), and Norma. 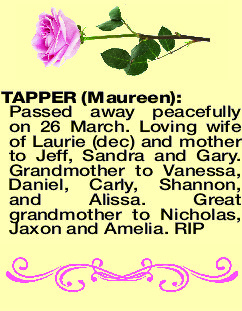 Aunty of Jannene, Gillian and Alan. 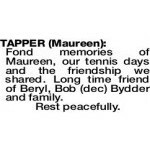 She lived her full life, especially sport, with great fairness. 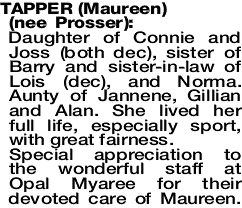 Special appreciation to the wonderful staff at Opal Myaree for their devoted care of Maureen. 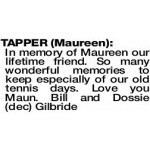 Fond memories of Maureen, our tennis days and the friendship we shared. 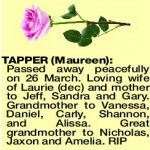 Long time friend of Beryl, Bob (dec) Bydder and family.